Our three PDQ Oklahoma locations are teaming up with legendary football coach Barry Switzer and the HBC Champions Foundation to bring a delicious new sandwich to PDQ. 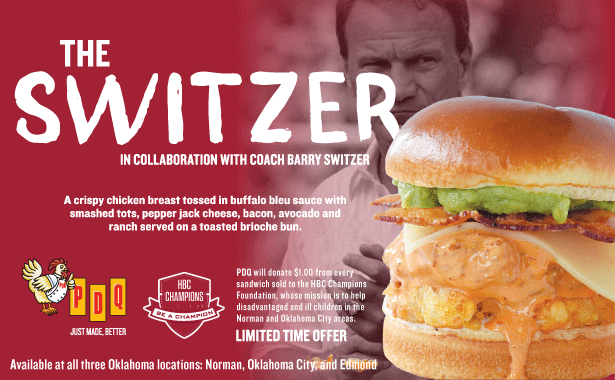 Starting today, guests can enjoy "The Switzer" sandwich at PDQ locations in Edmond, Norman and Oklahoma City, with $1.00 from every sandwich purchased being donated back to the HBC Champions Foundation. The Foundation's mission is to help disadvantaged and ill children in the Norman and Oklahoma City areas. The sandwich features PDQ's famous fresh, never frozen crispy chicken breast tossed in homemade Buffalo Bleu sauce with smashed tots, pepper jack cheese, bacon, avocado and homemade ranch served on a toasted brioche bun. So much flavor for your taste buds and all for a great cause too. Grab one today before it's too late!